The ancient Greeks had a word for antidote, pharmakos, that they very much used as a cure for chaos. In the pharmakos ritual, a deformed, weak, or mentally ill person would be wined and dined as a god, paraded through the streets, and then ritually murdered outside the city. It is easy for us moderns to look back at such rituals and sneer at the primitive barbarity of it all. Yet, to the Greeks, it was very much a necessary transference of pent up all-against-all aggression and resentment before it spilled into runaway chaos. In other words, as the High Priest who led the plot to execute Jesus Caiaphas said, It is better that one man die than the whole nation perish. Today, we see clearly that the ancient world’s antidote to chaos—collective violence against an innocent person (or at least, no more guilty than anyone else for social tensions)—is nothing more than crowd madness and scapegoating. We are able to see this because of the lens the Bible provides us after two millenia of its narrative and ethic clarifying our perspective. In the Gospels, as René Girard helps us see, we have the inauguration of a personhood revolution in which every human being is made to be a sacred temple deserving of love and respect. In the Gospel accounts of his passion, Jesus wrestles the camera of mythic history away from the persecuting collective always searching for a scapegoat and undresses the crowd of all its power. It is not the gods or, in our modern case, ideology, that demands coercion and violence but petty, crowd-possessed people blinded by fear and envy. 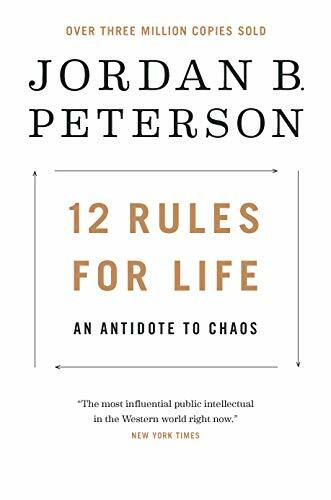 It is in that vein that Peterson’s 12 Rules for Life strikes such a powerful chord in our cultural moment. Each of the twelve axioms center on self-sacrifice rather than sacrifice of someone else—a radical new antidote for chaos much more dangerous and powerful than the old antidote of violent sacrifice that shaped our ancestral roots. Peterson’s meek defiance of victim-garbed collective aggression is in service to Jesus’s personhood revolution: the simple notion that instead of sacrificing your neighbors and blaming them for the chaos you feel, it is better to sacrifice your own pride, clean your own room, and resist the urge to reciprocate aggression and insult to those who seek to harm you. In short, it is better that we stop unconsciously imitating Caiaphas because the old pharmakos prescription is passed its expiration. We no longer need to cling to our collective group identities (race, gender, ethnicity, etc) to shape laws as a tool of vengeance against those we fear and hate. We can instead crucify the monster inside us. What made the West great was this simple truth. God desires mercy, not sacrifice. That the individual human being is sacred in body, mind, speech, and, by extension, the fruits of his or her labor. That no ideology or witch hunt can repeal the beauty and dignity of the individual, no matter who they are. Peterson’s encounters with angry, zealous mobs continue to capture the zeitgeist of our times the world over because telling the truth has a magnetic power. Just like the Gospel writers told the truth that Jesus, the one, was innocent and undeserving of violence from the many, smart phone cameras unmask and defang the power of people possessed by crowds screaming in Peterson’s ears as he peacefully keeps proclaiming the dignity of personhood. Peterson likes to tell people to clean their rooms before they seek to impose their will on society. This principle comes from the notion of not condemning one’s brother for the speck in their eye when we have a plank in our own. As we clean our rooms collectively, we will continue to find the hidden bones of our sacrificial victims, past and present. We will see the barbarity of voting crowds demanding laws that initiate violence against peaceful persons for nonviolent behaviors such as drug use, vices, or speech heresies like Peterson’s resistance to Canada’s C-14 transgender pronoun law. Reject the tyrannical impulse on the Left and the Right. The antidote for chaos is to love your neighbor. Previous article by David Gornoski: What’s Freedom?